The 1,000-petaled lotus symbol associated with the crown chakra is one that possesses transcendental meaning. Also known as the Sahasrara Chakra, the crown chakra is the energy center of spiritualism and universal knowledge that links you to the Divine. Considering the crown chakra is itself the energy center of renewal and transcendence, the lotus flower is symbolically appropriate. Some illustrations of the crown chakra symbol will include an “Om” image seated in the lotus’ center. Within Hinduism, the Om is symbolic of the Absolute — all that was, is, and will be — or Brahman. According to ancient tradition, to understand the incomprehensible is impossible for the human mind, therefore, representing the absolute in a single symbol makes things a bit easier. As the crown chakra ties you to the Divine and Brahman, it only makes sense for those symbols that depict the Om to be included in the symbol meaning. 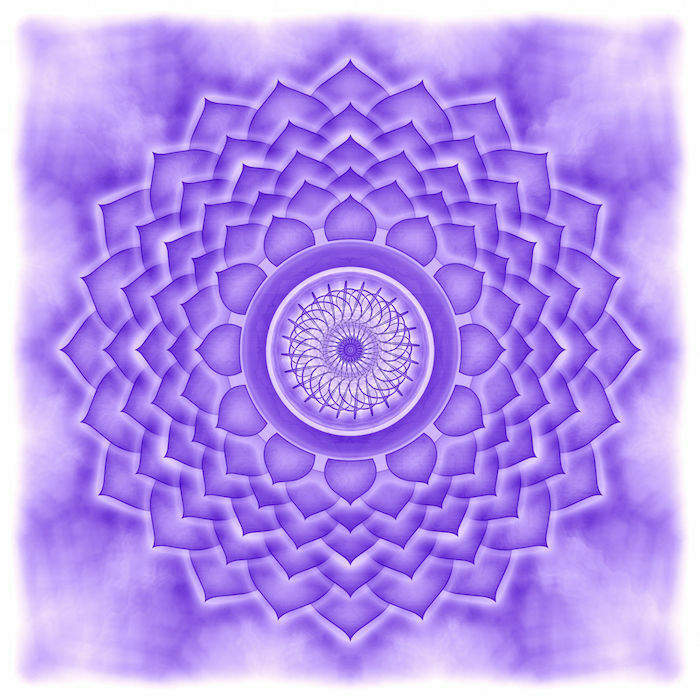 No explanation of the crown chakra symbol meaning would be complete without an exploration of the colors used to depict it — violet and white. Violet is the traditional color associated with spiritualism and intuition, while white is commonly accepted as a hue of purity, forgiveness, and renewal. Taken together, these colors are a good marriage of hues for the energy center that governs your ability to forgive, awaken and hone your intuition, and also cleanse and renew yourself physically, emotionally, and spiritually.